The Fashionista’s 1 inch tourmaline ceramic floating plates transform your hair from frizzy to silky straight and then some! This NuMe styling tool is designed to give you versatility. Whether you are in the mood for glamorous waves, stunning curls or stick straight hair, the Fashionista is your answer. Flip and curl styles are a breeze thanks to the Fashionista’s rounded edges, which also prevent bend or kink lines in your hair. Due to the wavelength of the infrared technology, it allows heat to penetrate directly into the hair shaft, which means less time for styling, as well as less heat exposure. The floating plates have a small suspension system that moves and compresses your hair while styling, acting as a cushion. 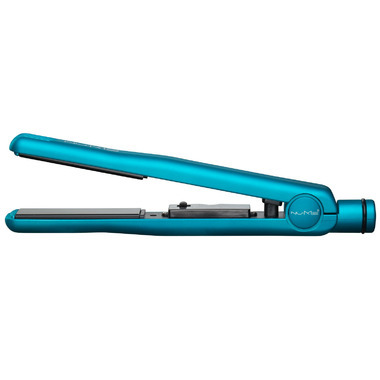 That means this straightner will move smoothly, without tugging or pulling your hair. Not only will the Fashionista make styling a breeze, but it is less damaging to you hair!